….Jenn made me participate in the VSN over at Splitcoast last evening. Here is the first card I made. It was for the sketch challenge. Of course I had to change the sketch up a little. I switched the heart for a butterfly. The card base is a 4 1/4″ x 8 1/2″ piece of Not Quite Navy cardstock folded in half. 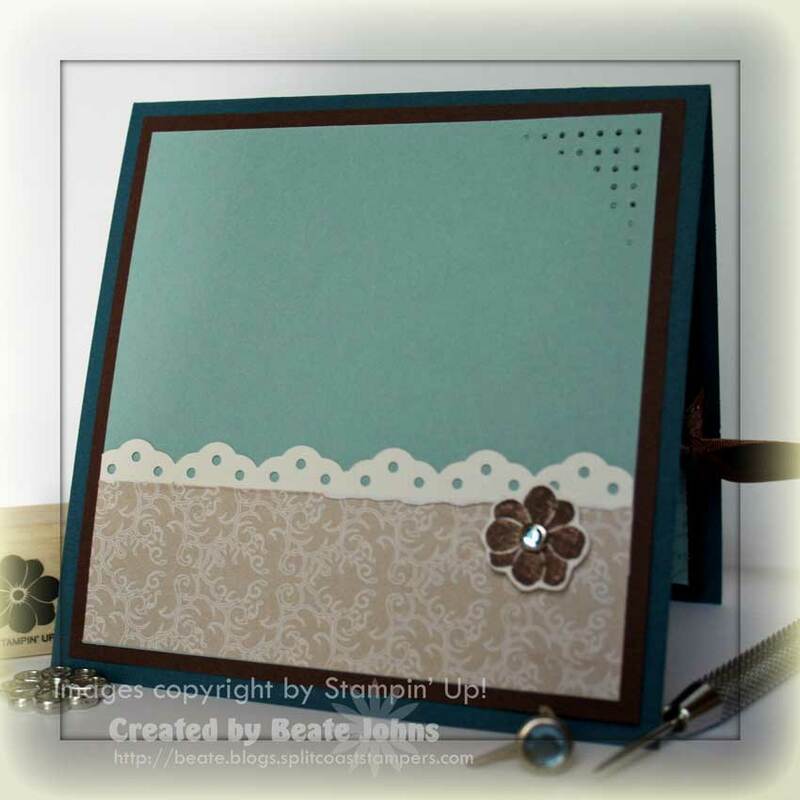 The next layers is a 4″ square of Chocolate Chip cardstock layered with a 3 3/4″ square of Baja Breeze cardstock on top. En FrancaisBackground was stamped on the Baja cardstock with Baja ink. The edges were distressed with the cutter kit. The corners were paper pierced. Retired Chocolate Satin ribbon was tied around both layers. Both circles were cut out withCircle Nestabilities. The smaller circle was cut out of Bella Bleu Designer Paper, the edges were paper pierced. For the inside of the card, I repeated the layers of the front of the card. On the Baja Breeze layer I added a 1 1/4″ strip of Bella Blue Designer paper and a Eyelet Border punchedstrip of Shimmery White cardstock. I just love Asela’s little Snow family and had to use it again. When I made the first card, I had stamped several images and ran them with different Nestabilities die cuts through my Cuttlebug. They were staring at me wanting to be used! I love these dies. They are easy and I can get scalloped rectangles, squares, ovals and circles in so many sizes! What a great idea to invent dies for that instead of different size punches. I think I will sell my Marvy punches, if anyone wants them. I can’t wait for Stampin’ Up!’s new catalog. I need new images. I have been playing with the same images since July for the main catalog and August from the mini! That’s simply too long! How sad am I to get bored so quickly? The card base is a 5 1/4″ x 10 1/2″ piece of Always Artichoke cardstock. It was folded in half and the corners on the right side were punched with the corner rounder. The next layer was a 4 1/2″ x 4 5/8″ piece of sponged Blue Bayou with the right corners rounded, followed by a 1/4″ smaller Wintergreen Designer paper piece, that was corner rounded and paper pierced. The last two background layers were cut with rectangle Nestabilities die. The sponged Blue Bayou layer measures 3 1/8″ x 3 1/2″, the Always Artichoke Prints Designer paper layer is cut with the next smaller die. I adhered them together and tied black polka dotted May Arts ribbon to the left hand side of it. 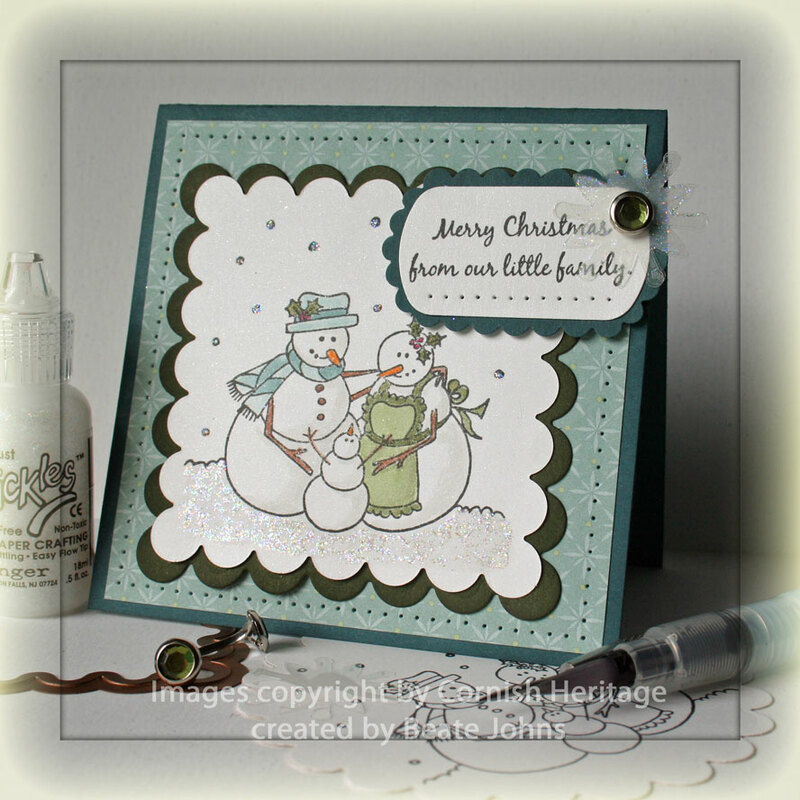 The Snow family image was cut with an oval Nestabilities die and layered on the next bigger scallop oval in basic black. I colored the image with Blue Bayou, Soft Sky, Close to Cocoa, Going Gray, Purely Pomegranate, Always Artichoke and Pumpkin Pie Classic inks and my Aqua Painter. Amuse Creative Candy stickers were added over the snowflakes. The saying was stamped in Black Palette ink on a metal edged circle tag and layered on a black punchout made with the scallop circle punch. I am sorry I have been quiet lately. The weekend was really busy. Yesterday I didn’t get done doing chores until about 3 p.m. Then the kids came home and Rebecca and I hung out outside with our neighbors. Rebecca loves the little toddler they had. It was a great day….but I didn’t get to stamp. After not having stamped for a while, it’s always hard for me to get creative. Good thing I had new rubber laying around!!! Asela Hopkins created this adorable stamps. You can find them at Cornish Heritage. Not having had new rubber fix from Stampin’ Up! for a while, I was excited to play with these cute stamps. 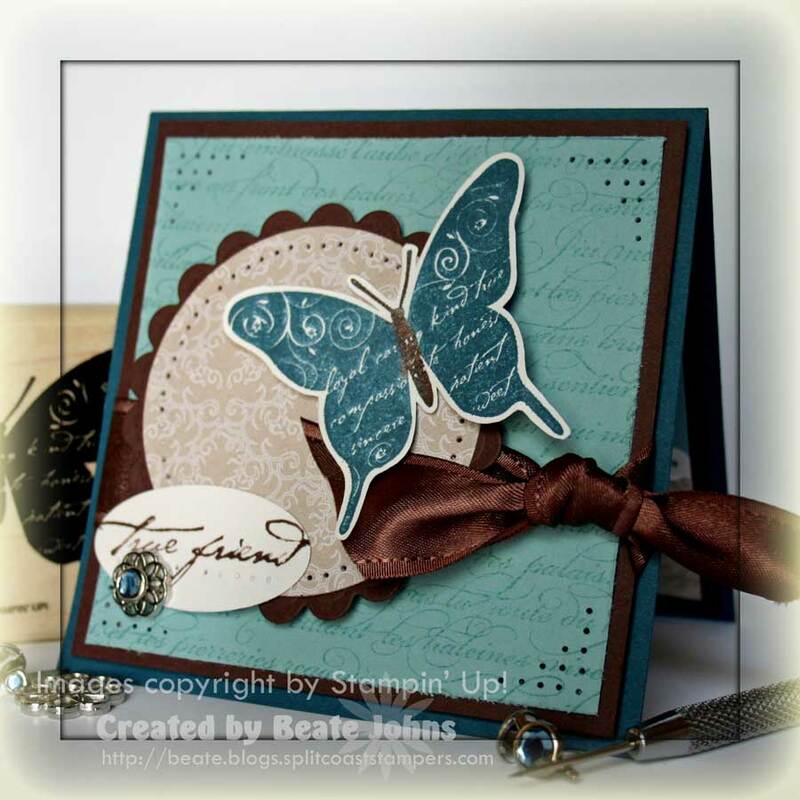 The card base is a sponged 4 1/4″ x 8 1/2″ piece of Blue Bayou cardstock. Next is a 4″ square of Wintergreen Designer Paper that was paper pierced around the edges. 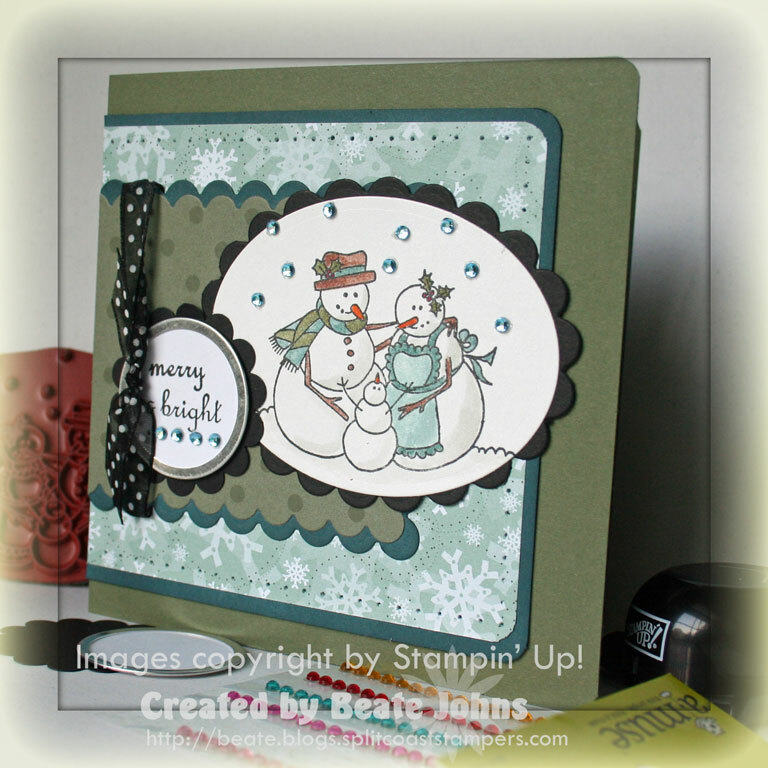 The snowman family was stamped on Shimmery White cardstock with Black Palette ink. I colored them in with Aqua Painter and Classic inks (Certainly Celery, Always Artichoke, Close to Cocoa, Soft Sky, Blue Bayou and Going Gray). I ran through the image through my Cuttlebug and cut it with Nestabilities dies into a scalloped square. It was layered on an Artichoke scallop square. I then added glitter to the snowflakes and the snow on the floor with Star Dust Stickles. I stamped the saying in Black Palette ink on Shimmery white and punched it out with the Key Tag punch. I layered it on a sponged piece of Blue Bayou cardstock and cut around it with scallop scissors. I punched out two snowflakes with the Snow Blossom punch out of Acetate, added Star Dust Stickles on one and sandwiched the other on top of it. After that dried I added it to the saying with a Ice Circle Rhinestone brads.